The 5th annual Beer Mile and Picnic, hosted by the Milwaukee Running Group OMG, will be run on Saturday, August 4, 2018 at the Rugby Field on Lincoln Memorial Drive at the lakefront. Activities start at 4:30pm. It’s a picnic type event with a variety of games and activities for adults and kids. The featured activity will be the solo and team Beer Mile competitions starting at 5:00pm. Official Beer Mile rules are simple — four laps on a 400 meter track, one 12oz beer per lap. Drink the beer, tip the can/bottle over your head, then run the lap. Official time is kept. If you can’t tackle four beers alone, you can form a team of two, three, or four members! Solo and team records are kept on the Milwaukee Running Group website https://goo.gl/pui5Mv where you can read of the history of the Milwaukee Beer Mile and see records and pictures from past Beer Miles. Bring your friends. Bring your own beer. Spread the word. This is Milwaukee’s only official Beer Mile and it’s a FREE! event. You do need to bring your own beer, but OMG will provide all the logistics and picnic amenities. You are welcome to bring a snack or food item to share for the picnic. There is plenty of parking at and near the field. Milwaukee’s only official Beer Mile is sponsored by Milwaukee Running Group – OMG as a FREE! event. If you’re not running you can volunteer or spectate. We need lots of spectators! Meetup Event. Register for the Beer Mile using Meetup.com. It’s free to join the Milwaukee Running Group. Facebook Event. Register for the Beer Mile using our public Facebook event. You can also “Join” the Milwaukee Running Group – OMG Facebook Page for free to see what we’re all about. Milwaukee / OMG holds the current Group World Records with 61 participants set during the 2016 running of the Beer Mile in Rugby Field, and 42 participants set during the 2015 running of the Beer Mile in Estabrook Park. The Milwaukee individual record for a male is 6:38 by Tim Cigelske, and 8:24 by Jenny Zwagerman. Both records were set on August 20, 2016. 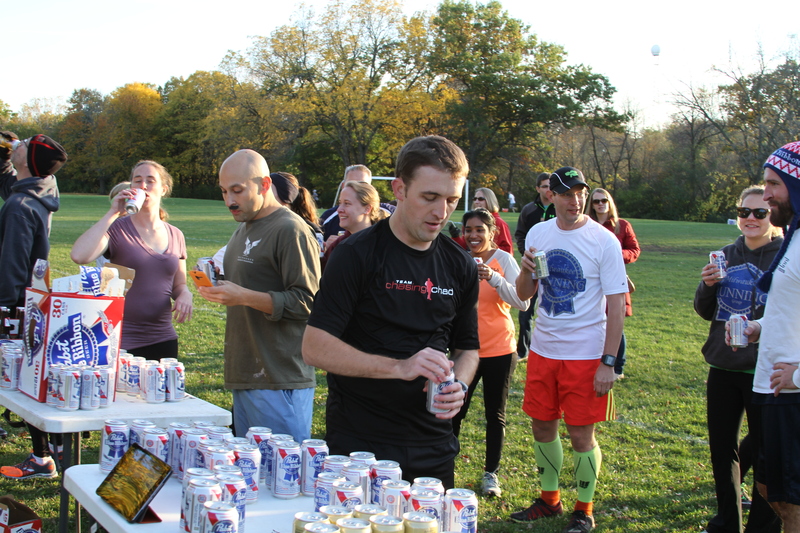 Group Beer Mile II was held on Saturday October 17, 2015 in Estabrook Park in Shorewood WI. That year, 42 runners completed the four beers four laps requirement and smashed the World Record set the previous year. The Group version of the Beer Mile recognizes the number of people running a Beer Mile at the same time, and puts less emphasize on individual times (although individual times are recorded and posted). This creates a fun, social, mostly non-competitive event where runners fast and slow can enjoy the Beer Mile together. An official beer mile consists of four beers over four laps on a 400 meter track. One beer per lap. The first Group World Record was set in 2014 by 26 members of OMG (and 30 spectators) the record was broken in 2015 with about 100 people in attendance. There are three participation options. Runner. Volunteer. Spectator. New in 2015 was the addition of Beer Mile Relay teams for those who don’t / can’t / won’t drink four beers, but could manage to down one or two as part of a team. All runners bring four cans / bottles of their own beer. Many participants preferred Pabst (alcohol content is 4.7%), but any beer was allowed. Note: To officially qualify for individual records the beer must be 5% alcohol or greater, but the “Group” records do have the same rules. Runners were encouraged to bring a friend to cheer, and to act as their designated driver. Ever since it’s murky origins in the last 1980s, the Beer Mile has been run by thousands of people, but always individuals attempting to set individual records. Example: The current individual world record, for the fastest beer mile, 4 minutes 57 seconds, was set in the spring of 2014. But what about groups records? Until now, there are no official or unofficial records for the number of people completing a Beer Mile all in one attempt — the Group Beer Mile. The group rules are mostly the same as the official rules listed on the BeerMile.com website. But we have made two new additions. The Group must raise money for a local charity with some sort of link to running. The time to complete the race is not tracked. It’s all about participation! There are two records to establish. 1) Total number of people completing the Group Beer Mile, and 2) Total amount of money raised. The most current Team/Group World Records are posted below. The rules for the Group Beer Mile and directions for submitting Group Beer Mile entries are listed below. The official “Group Beer Mile” rules were established by the Milwaukee Running Group – OMG and were adapted for teams/groups from the rules for individuals posted at Beermile.com. The Group Beer Mile consists of four beers over a one mile course. For smaller groups this is done on a standard 400 meter track. One beer per lap, four laps. For larger groups this is done over a one mile course with “aid stations” for the beer stops. There are two major rule changes for groups. The time to complete the race is mostly not important, although there is a cut off time of 30 minutes. 1. Each group member will drink four cans of beer and runs four laps on a track (Start – beer, lap, beer, lap, beer, lap, beer, lap – Finish). 2. The group world records are established by 1) counting the number of group members who cross the finish line in under 30 minutes and 2) recording the amount of money raised for charity. Both records come with bragging rights. 3. Any group member can drop out at any time without penalty, but the “group” record is set based on the number who finish, including penalty laps. 5. Competitors can drink canned or bottled beer and the cans/bottles should not be less than 355ml (the standard can volume) or 12oz (the imperial equivalent). 8. Beer must be a minimum of 3.5% alcohol by volume. No hard ciders and or lemonades. The beer must be a fermented alcoholic beverage brewed from malt and flavored with hops. * It is strongly recommended, when attempting official records, to tip the empty beer can or bottle over your head at the end of a chug to verify an empty vessel. Patrick Bieser, Christina Lundberg, Morgan Schuman, Tim Cigelske, Renee Meyer, Andrei Nemilentsau, Kurt Ohlinger, Two friends of Kurt Ohlinger, Matthew Friedel, Dan Szedziewski, Emily Meingast, Beth Riefe, Andrew White, Matt Jacobson, Emily Larson, Krista Dudley, Sheila Wordell, Kristin Kelsay, Tamara Cohen, Jennifer Louise Hesson, Manoj Swearingen, Gina Becker. Official Group Beer Mile Race Results. The Group Beer Mile II was organized and sponsored by the Milwaukee Running Group – OMG. When is the beer mile for 2017?